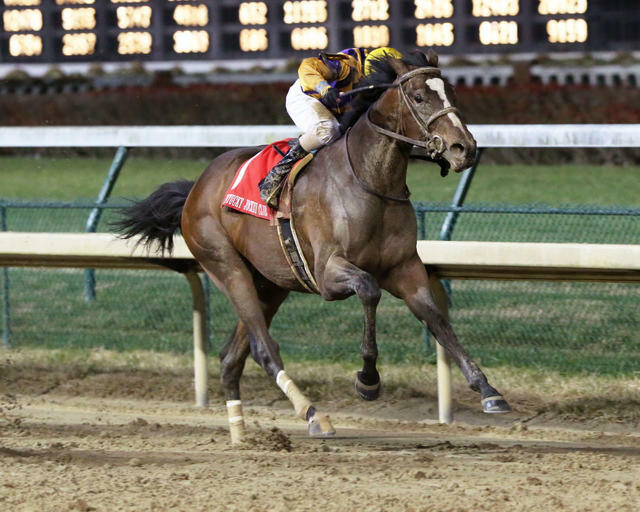 Signalman, who finished third in the Breeders’ Cup Juvenile (Grade I) just 22 days ago, grabbed the lead with three-sixteenths of a mile to run and turned back a late charge from Plus Que Parfait to win Saturday’s 92nd running of the $200,000 Kentucky Jockey Club (Grade II) at Churchill Downs by a neck. Signalman paid $9.20, $5.20 and $3.80. Plus Que Parfait, at odds of 14-1 under Julien Leparoux, paid $14.20 and $9.80. Limonite, who went to post at 20-1 with Ricardo Santana Jr. aboard, returned $9.20 to show. Each of the 12 races on Saturday at Churchill Downs was exclusively for 2-year-olds that may have aspirations of trail-blazing their way to next spring’s Kentucky Derby Presented by Woodford Reserve and Longines Kentucky Oaks. Inaugurated in 2005, Churchill Downs’ “Stars of Tomorrow” programs have helped launched the careers of numerous graded stakes winners, including more than 50 future Grade I winners led by Super Saver; Horse of the Year and Breeders’ Cup Classic winner Gun Runner; 2011 Preakness and 2012 Met Mile and Clark Handicap winner Shackleford; 2009 Horse of the Year Rachel Alexandra; 2012 Breeders’ Cup Classic and 2013 Stephen Foster Handicap hero Fort Larned; 2012 Kentucky Oaks winner Believe You Can; 2013 champion 3-year-old Will Take Charge; and 2016 Belmont Stakes winner Creator. Racing at Churchill Downs continues Sunday at 1 p.m. ET with a 12-race card for closing day of the 21-day Fall Meet. There will be no massive Single 6 Jackpot carryover pool to chase. The sequence went down with only one winning combination for a whopping $500,256.88.